In Africa, an evil terrorist named Musseem Tabrak (Ryan) seems to be gaining political influence in his region. In order to further his nefarious ends, he kidnaps the wife and son of one of his rivals. That’s when the ambassador, Harry Applegate (Gordon), calls in the only solution to this geopolitical problem: Monroe Bieler (Ginty). Bieler is a warrior who was imprisoned by Tabrak for twelve years and is burning with the desire for revenge. Applegate teams him up with a guy from the U.S. consulate named Chuck Hawley (Brophy), but things really start to heat up when Bieler re-connects with old warhorse Dutch Busselmeyer (Cam). Along with love interest/reluctant compatriot Sam (Tweed), the four unlikely heroes proceed to shoot, blast, and blow up the minions of Tabrak – but who is the true mastermind? Will Applegate wrap himself in the flag…and will Monroe Bieler live to machine-gun-shoot another day? 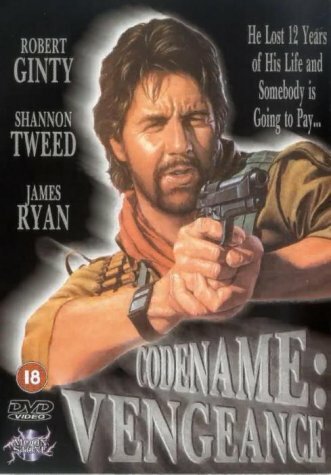 Fan favorite Robert Ginty saves the day in CODE NAME VENGEANCE, an entertaining shoot-em-up/blow-em-up that you pretty much have to love. It's an AIP-distributed outing from director David Winters which looks more professional than usual. 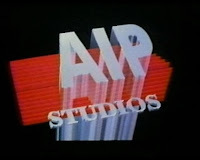 His production company this time around was The Killmasters Company, and when you see that that is the first credit on the screen, you know you’re in for a good time. As we’ve noted before, there are many types of dumb. Thankfully, Code Name Vengeance is the fun kind of dumb. Lots of very stupid things happen, but you can’t help but smile. The movie has that 80’s charm mixed with the type of charm that comes from clunky editing and ridiculously-staged action scenes. The viewer can get by on this combination of dumbness and charm any day of the week. It is also satisfying to see black-robed terrorists getting killed by the good guys. There are many instances where all this comes together. For example, in one scene, there are some terrorists in an abandoned warehouse. Ginty somehow hooks a bunch of grenades onto a very, very slow-moving forklift and sends it towards them. The baddies see this coming and have ample time to run away. Instead, they just sit there for a long time, yelling. Then they blow up. Thank goodness. When we first see Ginty, he’s embroiled in a prison-yard fight and he looks a lot like Chuck Norris. Then we see Gordon as Applegate and he looks a lot like John Saxon. We went on Cam watch and he eventually shows up 43 minutes in. He adds a lot of energy and even gets into the shooting action with the younger cast members. 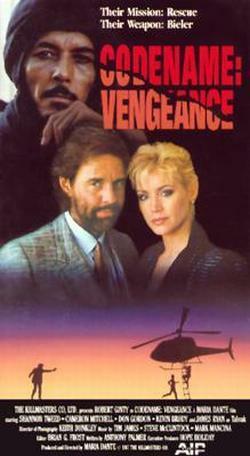 He would shortly re-team with James Ryan in another South Africa-shot David Winters movie, Rage To Kill (1988). All the other characters, but especially Hawley, say Bieler’s name many, many times. Almost every sentence they say ends with the word “Bieler”. “I don’t think so, Bieler”, “Not a good idea, Bieler”, etc. It’s not even that cool of a name. By contrast, James Ryan’s name in Rage To Kill was Blaine Striker. Now that’s a name worth repeating. Bieler is dangerously close to Bieber. Obviously they must have known that in 1988 and should have acted accordingly. The music, by Steve McClintock along with Mark Mancina and Tim James, is terrific and McClintock contributes yet another excellent song, “Is It Really Love?” This just goes to further prove that McClintock was one of the most underrated musical talents of the 80’s. All the ingredients are here: the Winters direction, the McClintock music, the conspiracy that goes all the way to the top, the terrorists getting blown up, the silliness, the combination of Cam Mitchell, Shannon Tweed, and Robert Ginty, and it was the 80’s. Consequently, it’s easy to love Code Name Vengeance. We say give it a watch. I agree. This was a very entertaining movie, thankfully not produced by AIP. David Winters and Robert Ginty also collaborated on the equally great Mission: Kill, which was made in Mexico. Definitely agree on Striker/Stryker being the coolest possible name for an action hero.